.....And the weather has grown warmer. I've also been very busy. 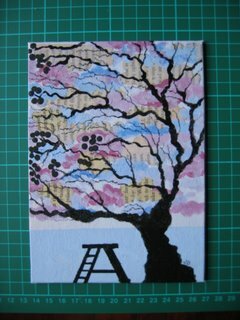 Just finished a series of small mix media paintings, which will be going to one of my best friends for Christmas. I don't like giving shabby presents and given my unemployed status at the moment, I can't really afford to give beautiful things, so I decided to make them. So this is the 1st of three, inspired by the jacaranda tree outside sunroom window, which is just now starting to shed its crap all over the street and the footpath. I'll post the other two pieces later. I also added more ideas to my art diary over the last two weeks and made two expensive trips to the art supply store. 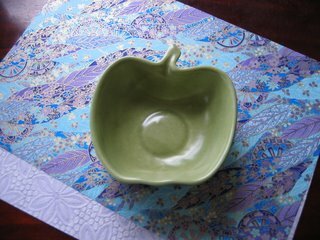 Also went to the Rozelle 2nd hand markets to get some old books and this wonderful apple shaped bowl. This week I'm going to Lincraft and Spotlight to look at sewing machines and fabric. Not sure much is going to get done creating-wise this week as we have a guest from France, one of the geezer's very best friends. He'll be sleeping in the living room (for 10 days from Wednesday), which is right next to the sunroom, which has become my defacto work space. Oh well! I'll have an excuse to clean. I'll probably also use this time to convert to the next version of Bugger, I mean Blogger.